Ni No Kuni: Wrath of the White Witch, is an RPG on the PS3. 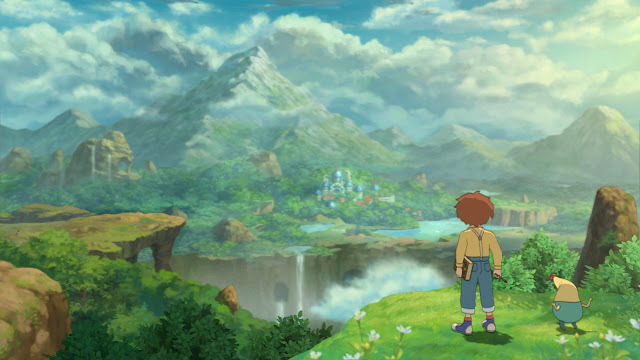 Co-developed by Level-5 and Studio Ghibli, the game features stunning animation and a child-like story. Ni No Kuni starts out on an UP note. This trauma inducing event propels the protagonist, Oliver, on an epic journey to a parallel world. It is there that an evil being, Shadar, is wrecking havoc on the lands denizens. Shadar is a dark menace who enjoys stealing parts of the soul. With every yin comes a yang–this is a Japanese RPG after all–, the showdown between Shadar and Oliver “the pure-hearted one” is only a matter of hours of leveling. One of the core components of Ni No Kuni is soul restoration. Example: Say Shadar took a person’s enthusiasm, Oliver must now find someone else with excess enthusiasm, ask for it, and give it to the person who is lacking. As a Christian, I cannot help but notice a similarity of sorts between Christ and Oliver. They both work on souls! Son of God, restores/completes the soul when a person simply believes in him. Mere boy, completes souls upon request for quest rewards. I have enjoyed Ni No Kuni so far but have to admit that the pacing is slow. The game reminds me of being at an idyllic summer camp by the lake. Not such a bad thing unless you hated summer camp as a kid. Never went to summer camp. so difficult to relate, but this seems like a game I’d enjoy. Just not sure if I want to pay full price for it. Ni No Kuni does not have the spark for me. At least not a $54.99 spark. The big emotional launch pad, at the beginning of the game, did not resonate with me. I was like, “what?”. I seriously did not understand what had happened until some background character explained it. Talk about falling flat. What I have liked about the game are the visuals and characters. There is no other game I can think of that has names like Ding Dong Dell, Mr. Drippy, or even The Cat King. The game is imaginative and whimsical. I enjoy that. I especially like that I can play this game in front of my 3 year old and not have to worry. I think at this point I’m about 3-4 hours in. I am going to keep playing to see if “the spark” is evident. I’ll keep you updated. I want to finish Uncharted. I’m halfway through 3. But by now, I forget what’s going on. I think I stopped working on it in late summer. The other titles? Yeah. I guess they did grab me. Never got super far in Diablo 2, but that was also a unique college multiplayer experience that’s just not the same when you’re by yourself. What games have had “the spark” for you? Uncharted 3 almost falls apart during the boat junkyard level. Felt like filler. The demo sucked. No better way to say that. What the demo did highlight is how cheap some of the boss fights can be. The game lulls you with the rich visuals and makes you think it is easy. Suddenly, you’ll find yourself in a normal fight (not even a boss fight) and dead due to low level. I have died so many times that I have actually grown to love the “death screen”. On that note, whenever you die you lose all or a percentage of your money. What you do not lose is your level experience. I like how the game respects your time. Revengeance seems like fun. Which indie games do you like? I loved Flower but hated Journey. Play Journey online or offline? That was one game that really got me into catching what God was doing in the game scene. The temple scene reminded me of stuff I’d only experienced in worship before and didn’t have words to express or share it with others. But yeah, other favorite indies would probably be Bastion, Mark of the Ninja, and Hotline Miami at the moment. But that’s mostly in terms of gameplay. Not necessarily lots of God stuff. But all quite fascinating. I should probably compose a list of all the indies I’ve gotten and played in the last year. The list is a way too long for this blog. I’m pretty sure I like most of them. Maybe skim what I’ve written about on my blog because I’m lazy (should be working) at the moment? Played Journey online. I will admit that the game was definitely better whenever I was playing with someone else. I made the back-end of the journey all by myself. It was lonely. Thinking about the game now, I loved the ending. The bright colors, happy music, etc. In life, I’m always wanting to fast forward. I want to jump to the next big life scene. I hate the journey. What is funny is that that is what life is all about, right? Especially as a Christian. Yeah. The ending won me over, too. The themes of life, hardship, and new birth are so great. I kinda liked the lonely experience when I played offline, too. That’s why the cloth creatures (“heavenly creatures” in my Charismatic mind) really stood out to me. They were my main companions and those who aided me in my quest. They’re there when others play with me too. But the heavenly creatures line the halls of our spiritual formation, servants of God, in the highest order. Demons usually get all the spiritual attention in videogames. I’m glad to see a change in pace from all that. Our spiritual journey is something we can usually only appreciate when we have a lot of road behind us. I never thought I’d be able to appreciate negative spiritual experiences until after I saw how they created an opportunity for powerful redemption down the road. Let me clarify: my pastor left our church, God, and his wife last year. This is a dude who taught me a poop ton of what I know about moving in the supernatural, how to hear from God, how to be a good leader, and even my pre-marital counselor. But what’s amazing is that after he left, and because of him lost our church building, none of our church family beside him was lost. We grew together and we all grew more into our own. When sharing my testimony with unbelievers, I share things like that: the good and the bad and how God’s consistently redeeming things – not just at initial salvation. I never thought of the cloth creatures (flying-carpet-manta-rays, in my mind) as “heavenly creatures.” Interesting. Sad to hear about your pastor and yet cool to hear how God has moved in the midst of what could have been a really sad story. I find it amazing how God gives us what we want, even if that means letting us go. Lately, I’ve been going through Donald Miller’s Storyline book. One of the first exercises in the book is to make a list of major positive and negative experiences in your life. You then take those experiences and place them on a timeline. Stepping back, I found it amazing that I could see God working throughout my life. Even in the bad times, times I consider wasted, God was working behind the scenes. One of my favorite God stories (although not at the time) is about asking my father-in-law’s permission to marry my now wife. The first time I went to him, we drove to a McDonald’s–this was not how I was picturing this whole thing going–. As a fly buzzed around my head, I remember him telling me that he had no peace over me marrying his daughter. I had prayed before the meeting that I would be happy with the outcome, no matter what. I told myself that I wanted God’s will to be done. I left the meeting feeling peace. Even though I had been rejected, I was okay with it. God was in control. A phone call later to a friend, I was pissed. I felt rejected, hurt, and beyond angry. I spent the next year dating my now wife. I spent most of that time dealing with the fallout of that one conversation. I was so mad. In retrospect, I can see God’s hand in the entire situation. A year later, I went to ask her Dad if I could marry her. This time he said yes. Both my wife and I now realize that we needed that extra year. We needed time to grow as individuals and as a couple. We both shudder to think of what would have happened had we pressed forward and done our own thing.